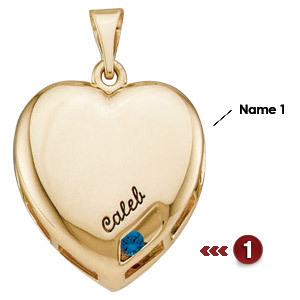 This polished gold heart pendant features personalization for 1 to 4 names and corresponding birthstones. Width is 17mm, height 17.25mm. Stones are 2.0 mm round cut, channel set. Engrave up to 8 characters per name. It is available with simulated or genuine birthstones. Choose between 10K or 14K yellow or white gold. Name 1 engraving is located at the bottom of the pendant, closest to the stones. Engraving positions ascend.